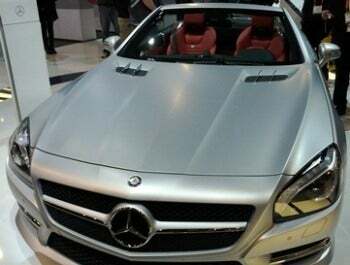 Mercedes' second-generation of its Mbrace in-vehicle communications system, the Mbrace2, will be shipping out in Mercedes' new SL Class vehicles in March 2012. 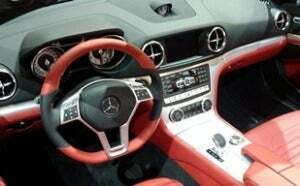 The German automaker made headlines by announcing that Mbrace2 will come with a Facebook application, among others. I got a chance to take a look at the Mbrace2, which has -- as Mercedes promised -- a limited version of Facebook that gets even more limited when the car is in motion. Mbrace2 can be controlled a few different ways -- including using the in-dash radio or a mouse-like knob that sits beside the shifter. The knob, which is surrounded by four buttons for (back, favorite, clear, and chair control) turns, so you can scroll through choices on the screen; and also pushes in all directions so you can direct a mouse around the screen. Turning the knob is probably the easiest way to control Mbrace2, though it's nice to have the mouse movement option just in case. To click, just hit the center of the knob, which is a button. 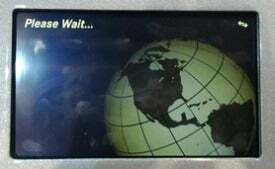 Unlike Ford MyTouch, the Mercedes Mbrace2 does not have a touchscreen. 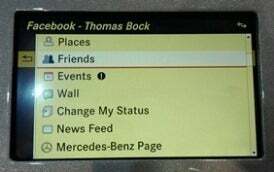 The Mbrace2 Facebook screen lets you check a number of different things on Facebook: Places, Friends, Events, Wall, News Feed, and the Mercedes-Benz Facebook page. Only Places, Friends, Change My Status, and Events are available when the car is not in park, however. Places lets you find businesses that have a presence on Facebook near your current location or near your destination. 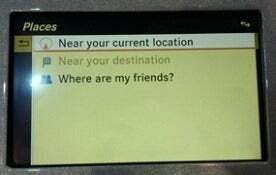 It can also locate your friends, if they've checked in anywhere near you. When you're driving, the Friends list is limited to friends who have contact information or addresses available on their Facebook page. You cannot see detailed information on any friends -- just their phone number and address. 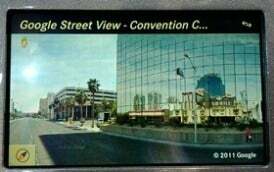 You also cannot see your Facebook Wall when the car is not in park. You can update your status when you're driving, but only with preset status updates that are created based on your location and/or destination. 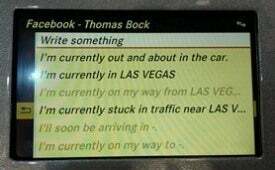 You can write your own status updates when the car is in park. Facebook isn't the only app available on Mercedes' Mbrace2 -- it supports several other location-based apps, such as Google Local Search and Google Street View (you can turn the knob to turn 360 degrees in Google Street View, but you can't zoom in or out). You can also browse the web freely on Mbrace2, though this feature is, again, blocked when the car is in motion. Websites also look less-than-stellar on the Mbrace2's interface, so you may just want to use your phone instead -- after all, you're already parked. Mercedes' Mbrace2 isn't really all that revolutionary; the company has trimmed down Facebook and squeezed it into an in-dash navigation/infotainment system. 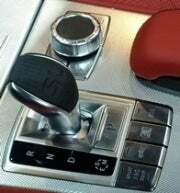 The interface is clunky for web browsing in general, and so it seems like something that will only be used in the direst of emergencies (say, your car breaks down and you really want to know what your friends are up to). Since most of the "cooler" features can only be used when the car is in parked, I think it makes more sense to just use your smartphone.